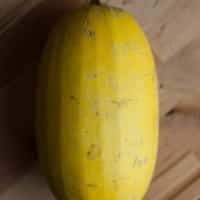 Green Curry Spaghetti Squash with Apple Chutney | Naturally.Green Curry Spaghetti Squash with Apple Chutney | Naturally. Preheat oven to 400˚. Slice spaghetti squash in half and scoop out the seeds. Place each squash piece cut side down in a pan and fill the pan with 1/4″ of water. Roast until the squash is tender, 40-50 minutes. Remove from oven and let cool slightly. In a medium pot, heat olive oil for apple chutney. Add in onions and ginger, cooking until fragrant, 3-4 minutes. Add in vinegar and give a good stir to loosen up an stuck onions. Add in the remaining ingredients and reduce heat to medium low. Let chutney cook until apples and dates have broken down into a chunky sauce, 15-20 minutes (depending on stove-top heat.) Add more water if chutney is too thick. Remove from heat and let sit until ready to serve. **“>I made a wonderful homemade green curry sauce from this recipe using vegetable broth and a touch less coconut milk (I’m not a *huge* fan of coconut flavor) I also subbed in some parsley in place of the cilantro.